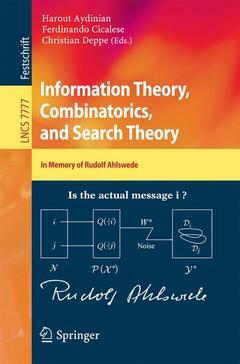 This volume is dedicated to the memory of Rudolf Ahlswede, who passed away in December 2010. The Festschrift contains 36 thoroughly refereed research papers from a memorial symposium, which took place in July 2011. The four macro-topics of this workshop: theory of games and strategic planning; combinatorial group testing and database mining; computational biology and string matching; information coding and spreading and patrolling on networks; provide a comprehensive picture of the vision Rudolf Ahlswede put forward of a broad and systematic theory of search. I. Information Theory.- 1 Two New Results for Identification for Sources.- 2 L-Identification for Uniformly Distributed Sources and the q-ary Identification Entropy of Second Order.- 3 Optimal Rate Region of Two-Hop Multiple Access Channel via Amplify-and-Forward Scheme.- 4 Strong Secrecy for Multiple Access Channels.- 5 Capacity Results for Arbitrarily Varying Wiretap Channels.- 6 On Oblivious Transfer Capacity.- 7 Achieving Net Feedback Gain in the Linear-Deterministic Butterfly Network with a Full-Duplex Relay.- 8 Uniformly Generating Origin Destination Tables.- 9 Identification via Quantum Channels.- 10 Classical-Quantum Arbitrarily Varying Wiretap Channel.- 11 Arbitrarily Varying and Compound Classical-Quantum Channels and a Note on Quantum Zero-Error Capacities.- 12 On the Value of Multiple Read/Write Streams for Data Compression.- 13 How to Read a Randomly Mixed Up Message.- 14 Multiple Objects: Error Exponents in Hypotheses Testing and Identification.- II. Combinatorics 15 Family Complexity and VC-Dimension.- 16 The Restricted Word Shadow Problem.- 17 Mixed Orthogonal Arrays, k-Dimensional M-Part Sperner Multi-families, and Full Multitransversals.- 18 Generic Algorithms for Factoring Strings.- 19 On Data Recovery in Distributed Databases.- 20 An Unstable Hypergraph Problem with a Unique Optimal Solution.- 21 Multiparty Communication Complexity of Vector–Valued and Sum–Type Functions.- 22 Threshold Functions for Distinct Parts: Revisiting Erd¨os–Lehner.- 23 On Some Structural Properties of Star and Pancake Graphs.- III. Search Theory.- 24 Threshold and Majority Group Testing.- 25 Superimposed Codes and Threshold Group Testing.- 26 New Construction of Error-Tolerant Pooling Designs.- 27 Density-Based Group Testing.- 28 Group Testing with Multiple Mutually-Obscuring Positives.- 29 An Efficient Algorithm for Combinatorial Group Testing.- 30 Randomized Post-optimization for t-Restrictions.- 31 Search for Sparse Active Inputs: A Review.- 32 Search When the Lie Depends on the Target.- 33 A Heuristic Solution of a Cutting Problem Using Hypergraphs.- 34 Remarks on History and Presence of Game Tree Search and Research.- 35 Multiplied Complete Fix-Free Codes and Shiftings Regarding the 3/4-Conjecture.- Michael Bodewig 36 Creating Order and Ballot Sequences.- Obituaries and Personal Memories.- Abschied.- 38 Rudi.- 39 Gedenkworte f¨ur Rudolf Ahlswede.- 40 In Memoriam Rudolf Ahlswede 1938 - 2010.- 41 Rudolf Ahlswede 1938-2010.- 42 Remembering Rudolf Ahlswede.- 43 Rudi Ahlswede.- 44 The Happy Connection between Rudi and Japanese Researchers.- 45 From Information Theory to Extremal Combinatorics: My Joint Works with Rudi Ahlswede.- 46 Mr. Schimanski and the Pragmatic Dean.- 47 Broken Pipes.- 48 Rudolf Ahlswede’s Funny Character.- 49 Two Anecdotes of Rudolf Ahlswede.- Bibliography of Rudolf Ahlswede’s Publications. One third of the papers originated in framework of the ZiF cooperation group "Search Methodologies"